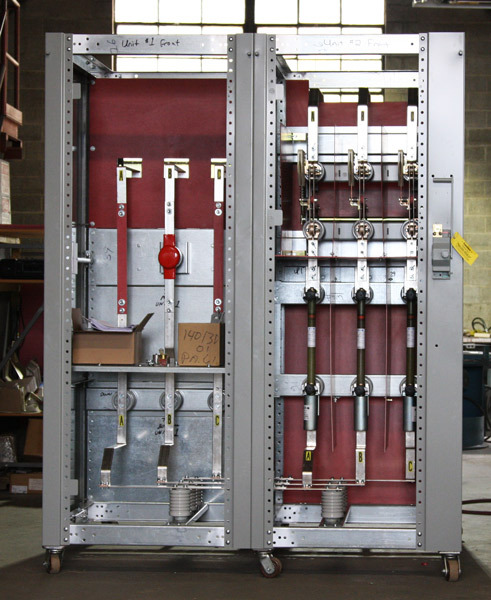 Penn Panel & Box Company manufactures the highest quality metal-enclosed interrupter switchgear, designed and built to suit your specific application. Switchgear is available for both indoor and outdoor applications (walk-in or non walk-in) with a nominal voltage rating of 2400V through 38kV. Matching and lining up to existing switchgear of any manufacturer is one of our strong points. Designing new switchgear to replace existing equipment will save you money. We will match existing conduit locations to lower your cost on installation. Metal-enclosed interrupter switchgear is designed, tested, and manufactured in accordance with the latest applicable standards of UL, ANSI, IEEE, NEMA, and NEC. The UL listing mark is affixed to each 5kV and 15kV section, showing conformance to UL standards and procedures.